Tomorrow, Danny and I will officially be getting on a plane and heading back to America for the first time in 18 months. Seriously, I can't believe we have been away for that long! To us, that means we are heading back to the land of normal... or at least our normal, but really what is "normal" anymore? 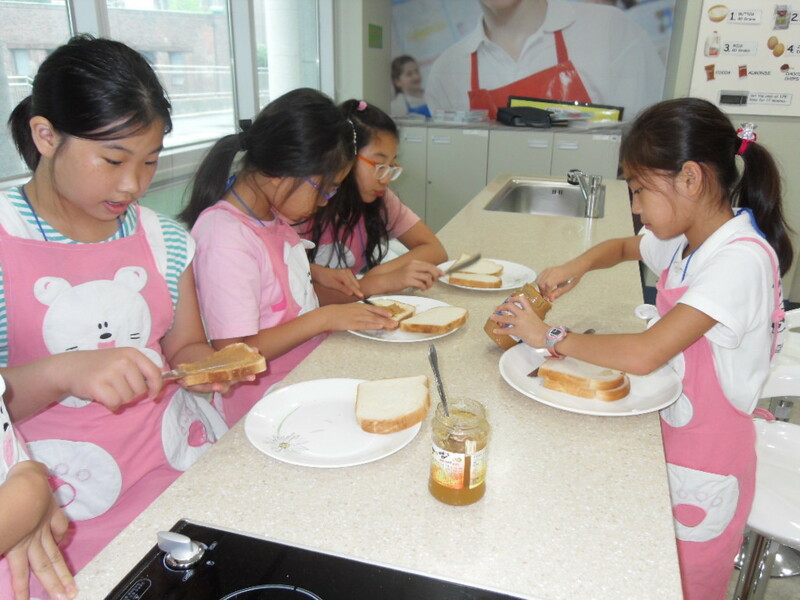 To me "normal" is peanut butter and jelly sandwiches, and lawns, and people who have different color eyes and hair, but to Korean kids none of those things are normal in their minds. Even though it has been difficult at times, I am really glad that this experience is helping me realize that not everyone grew up the way I did. It makes learning about Korea that much more interesting and it allows me to share some pretty cool stuff with students to help them expand their global views too. 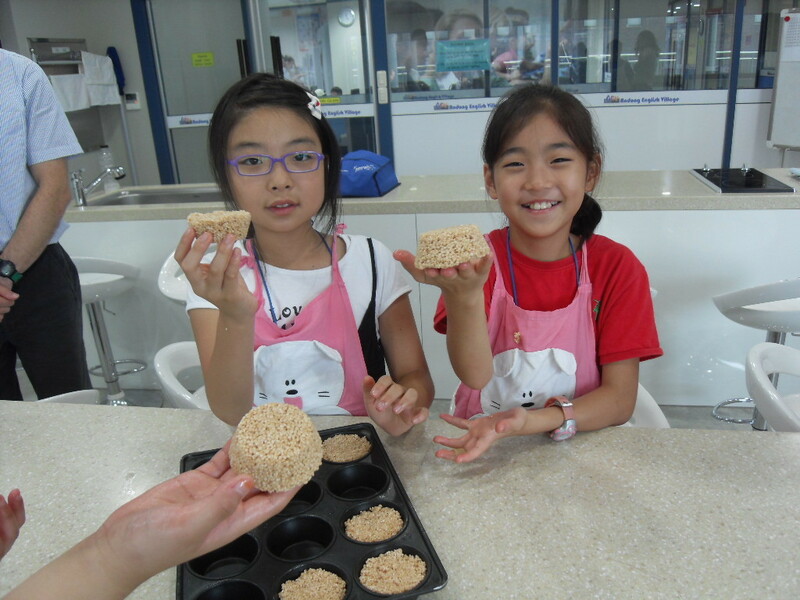 It may seem strange, but I feel like when I get to share a game like "steal the bacon" that I always played growing up at Camp Elim, or when I get to make Rice Crispie Treats with these kids for the first time ever, I am sharing a bit of "Americana" with them. They get to try something new, and I get to feel even more proud of where I came from. I know now that nobody's "normal" is better than anyone else's or that because I grew up in the "land of the free and the home of the brave..." that I know the best way to do things, but I do know that I am pretty stinkin' thankful to be an American. 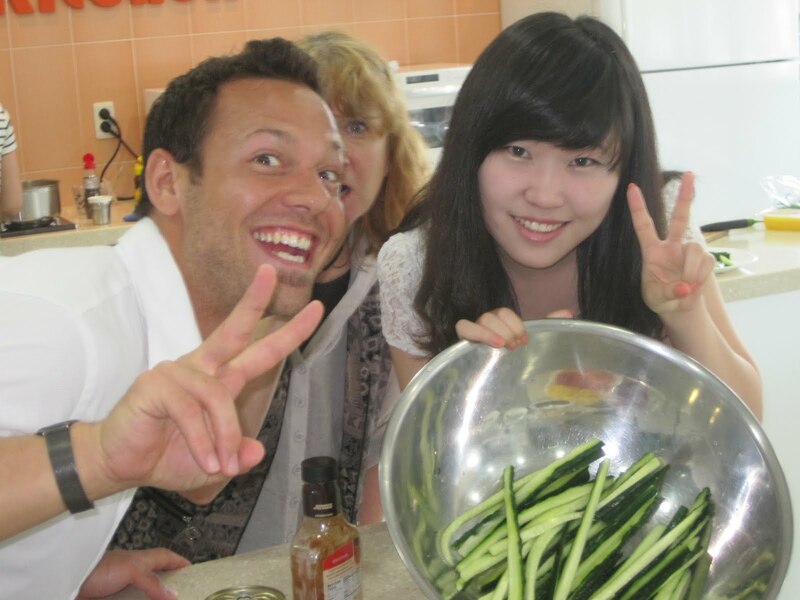 No matter what problems we are having in that country, it is a pretty amazing place, and there's nothing like living in Crazy Korea for 1 1/2 years to make you miss where you came from! It may not be the 4th of July, but I hope this makes you feel a little patriotic today... no matter where you are from! Recently Katy and I have spent some time discussing and subsequently laughing about the daily stories/frustrations that teaching young kids can bring. Last week we came home after a LONG day of teaching and as I vented my frustrations of the day we couldn't help but laugh about the sheer absurdity of the scenes we find ourselves in. For the past two weeks a small group of students and I had been working on putting together a five minute version of Peter Pan. 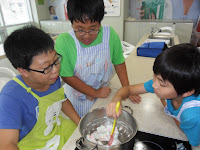 I can imagine there would be challenging moments if trying to accomplish this task with English speaking elementary students, but when you add to it that most of our students speak minimal amounts of English (and probably don't understand a lot of the words they are saying) it can make for some hair-pulling, teeth clenching, silent screaming, yet funny when removed from the scene, teaching moments. We were working on acting out the first scene where the brothers, Michael and John are pretending to sword fight in their bedroom. This practice just happened to be held in our "Grocery Store" classroom, where we have teaching aids such as plastic fruits, which kids can't seem to keep their hands off of. I like to think of my teaching style as pretty laid-back and especially when teaching 5th graders you've just got to "embrace the chaos" most of the time. So when Michael and john started using plastic baguettes and bananas as their prop swords, I thought okay, this is fine, but I told them "let's not use the baguettes because they break too easily." I turned my back for ten seconds to speak to Wendy and when I turned around again Michael and John were sword fighting with the baguettes again. "WHAT DID I SAY ABOUT SWORD FIGHTING WITH THE BAGUETTES?" Let's just say this was only one of the many ways that my patience was tested in this practice. 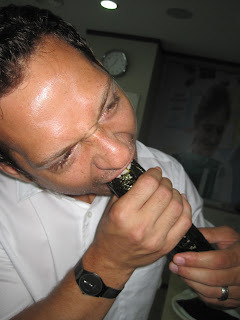 It wasn't until later that night as I was recounting this tale of Peter Pan, bananas and baguettes to my lovely wife that I realized how loony and comical my teaching frustrations can be. Ok, I know I said no more baguette fighting, but even a grown man knows that you can't just shake off a stab wound from a dangerously sharp plastic baguette. As a final note this little guys name was Gary (aka. Roley Poley) and he is by far one of the cutest yet clueless kids we've taught here in Korea. Katy made him "Ham" in her groups version of Toy Story last week but we both agreed that he would have been better as a "squeaking alien"... "Ohhewww, the claaaawwwww..." Man, Korean kids are funny. 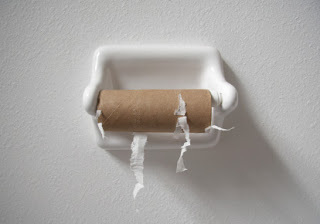 Growing up in America has made me accustomed to certain things. 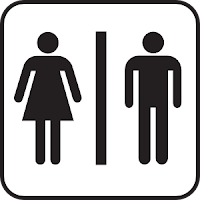 There was always soap in public bathrooms, people showered in shower stalls, and you only squatted when you were camping. 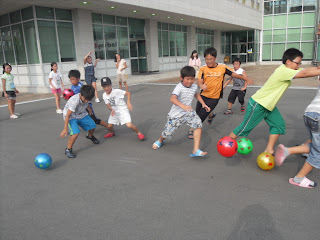 Being in Korean has made me realize that none of those things are the norm here. Danny and I have realized that Korea is the land of polar opposites. On one hand bathrooms leave room for improvement, on the other hand, I have never seen toilets with such interesting technology as in Korea. Who knew that you could get a toilet that has a seat warmer, a self cleaner, bidet, a fake flushing sound in case you have a problem with bathroom shyness. All of these things help with definite "rump relaxation" as Danny would say but sometimes when you don't know exactly what they will do, it can be a little nerve racking to go pushing unrecognizable buttons : ) Even still, I've gotta give one to Korea... Korea 2: America 2. The last big thing that is different about Korea is the bathroom/bathing situation. As we have mentioned before, Korea goes for the open shower choice as opposed to using bath tubs or shower stalls. I have read many reviews of hotels when we travel and noticed that Westerners often complain about "open" showers in Korea, but you are often hard pressed to find otherwise unless you go to a really nice hotel. Now its second nature to put on slippers before I go into any bathroom so as to protect my feet from getting wet. No longer am I surprised if the floor of any bathroom is wet or the whole bathroom is damp as a matter of fact. Because the whole bathroom is made to be constantly soaked, clean up is quick and easy just by rinsing everything off. 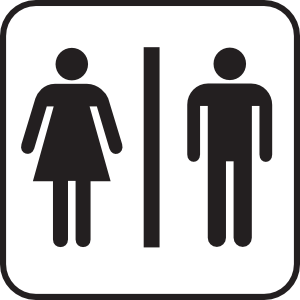 That would make the bathroom score Korea 3: America 2. However because everything is constantly wet, that also means that mold is easily found in most bathrooms which isn't exactly my favorite thing... Korea 3: America 3. Yikes...right? 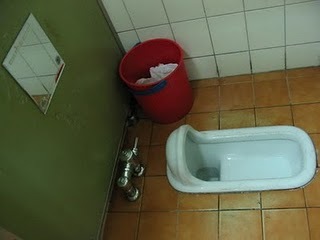 !And that ladies and gentleman, is all I have to say on the subject of Korean bathrooms. How to make Kimbap: a Korean staple! 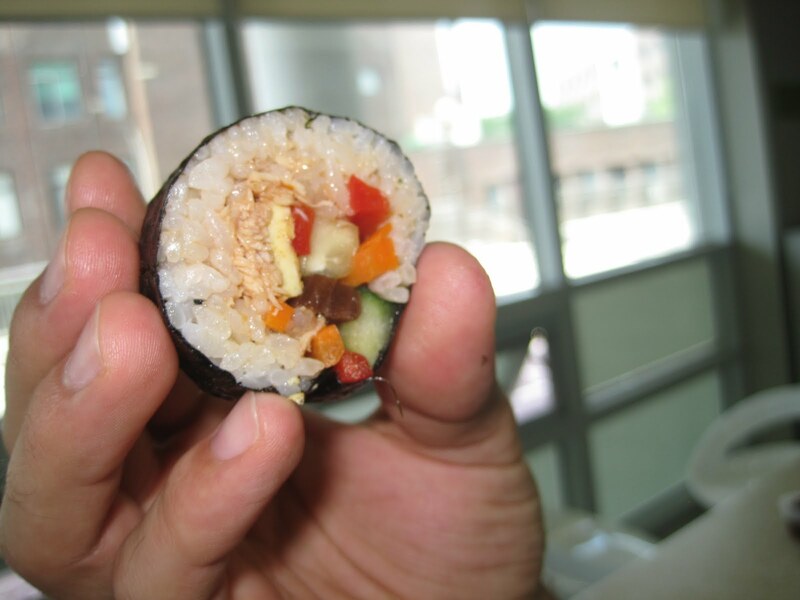 Today you are going to learn how to make kimbap: the traditional "picnic" or snack food of Korea. Much like a California roll, but Koreanized, kimbap is rice and various ingredients wrapped in seaweed or "kim". 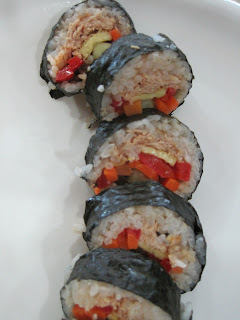 At first it really didn't trill me, but no kimbap is a food that I really enjoy eating for a light lunch or if we are traveling. 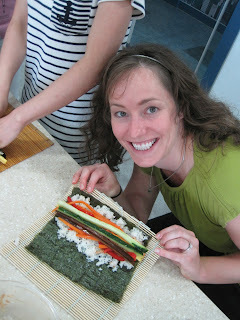 This past week, some of the student helpers at the English Village told us that they would teach us how to make kimbap so we were in! Even though Danny and I have an EXTREME love for sushi rolls, surprisingly enough we had never made any type of roll before. 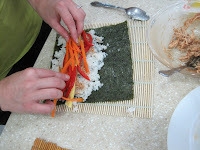 As we got ready to create the rolls, we laid out all the "traditional" kimbap ingredients and some not so traditional ones. Generally, kimbap contains egg fried thin and cut into strips, kimchi, yellow radish, cucumber, carrot, a soaked root that kinda has a teriaki taste to it, rice, and some sort of meat, usually ham or tuna. 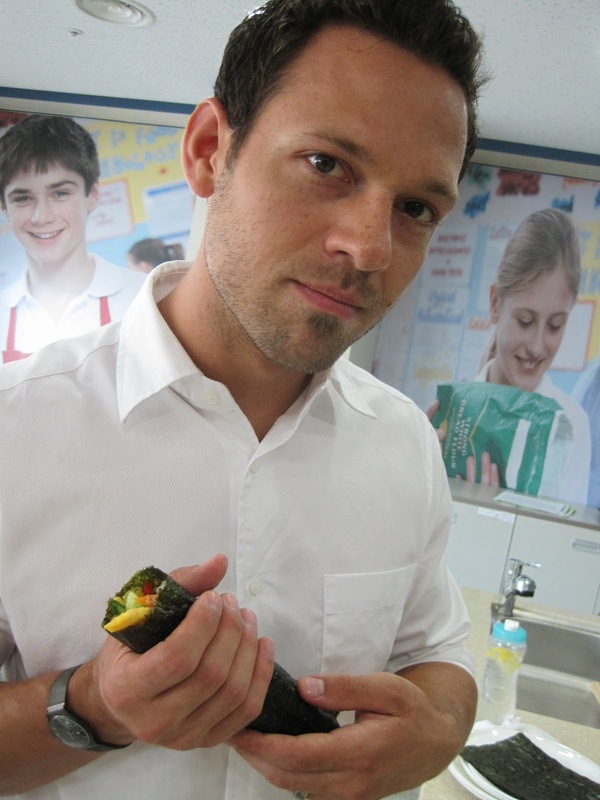 I brought chicken to try in my kimbap, and even though it weirded out the Koreans that I was steering away from the norm, I did it anyways. 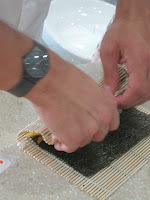 Step 1: Lay out the "kim" (seaweed wrap) on a sushi rolling mat. 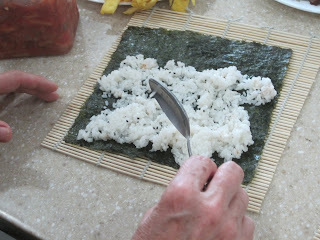 Step 2: Spread sticky rice over the kim, about 3/4 of the way, so you get rice all the way around the other ingredients. 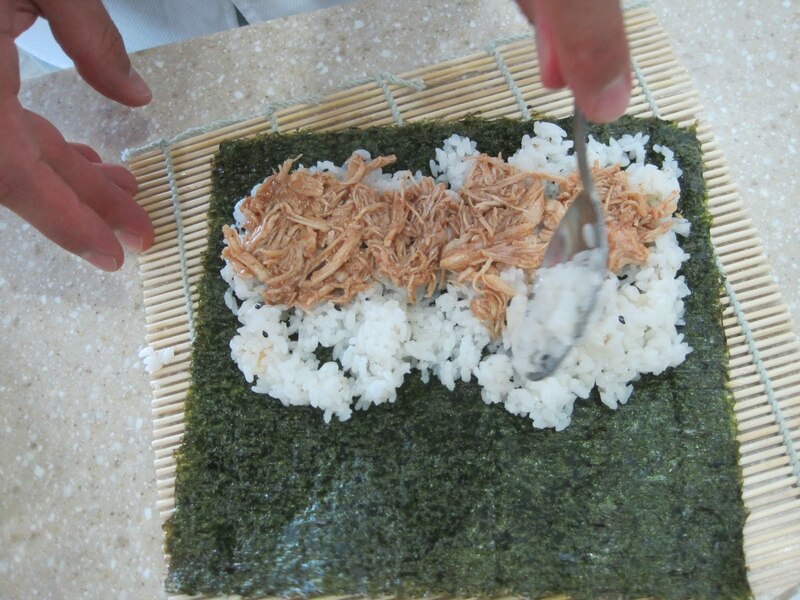 Step 3: Lay out the various ingredients that you want in your kimbap on the rice. Step 4: Fold over the kim and start rolling up your kimbap! 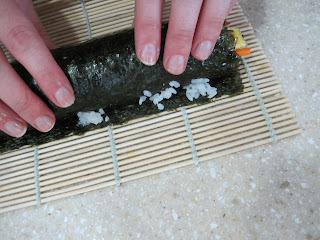 Step 5: Put a little sticky rice at the edge of the kim to help seal the roll together. And now enjoy! 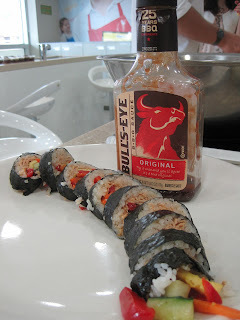 I decided to spice up my kimbap by doing a bbq chicken roll and it was pretty awesome. You could do beef, spicy tuna, ham, or basically anything else you can think of to make your kimbap what you want! 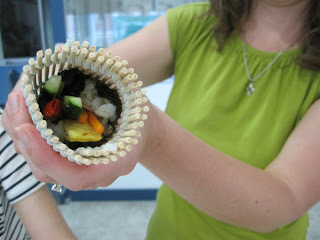 - Don't put too little rice or you won't get it to stick together well. 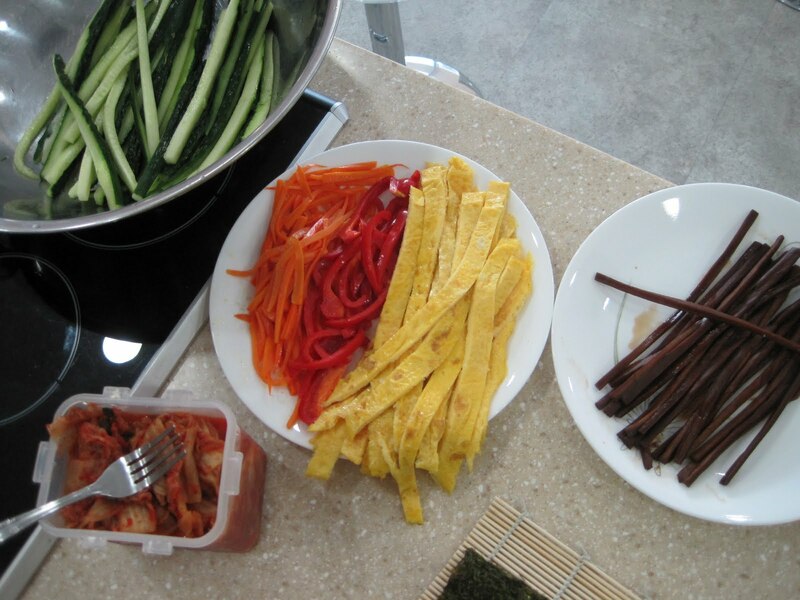 - Cut your veggies into long strips and if you want some veggies to be a little more tender to eat, like carrots or peppers, saute them in a pan for just a few minutes. - Spice up your sticky rice by adding a little sesame oil and black sesame seeds. - Salt your cucumber to get some of the excess water out of them. And there you go! 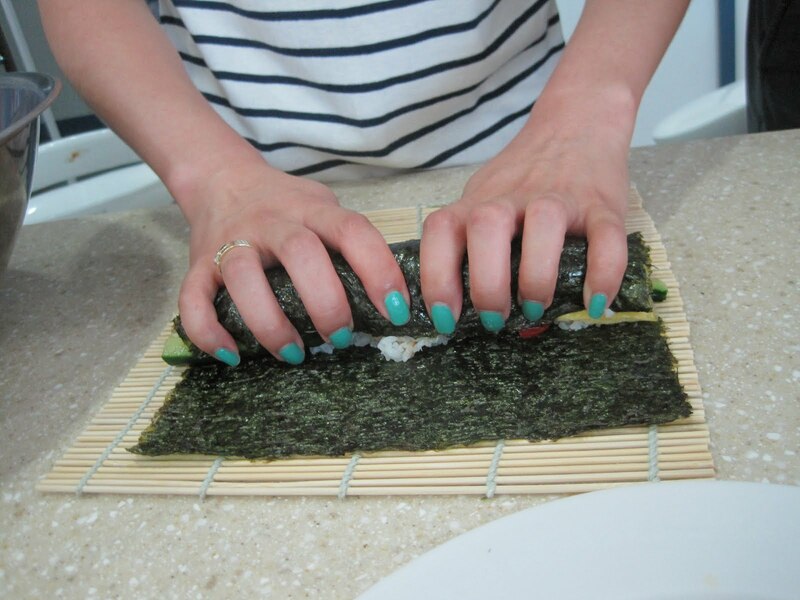 Go forth and make kimbap! 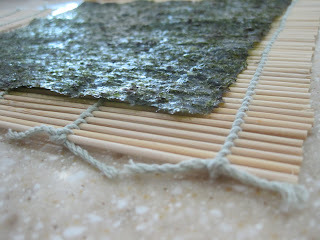 It's a delicious snack and I know once you have it, it will be a definite favorite. Enjoy!